Say Happy Valentines Day with our 5-Bar Sweetheart Soap Sampler that contains five flowers and candy bars of our goat milk soaps: Lavender Cream, Chocolate Cherry Cream, Vanilla Cream, Toasted Almond and Rose Cream. 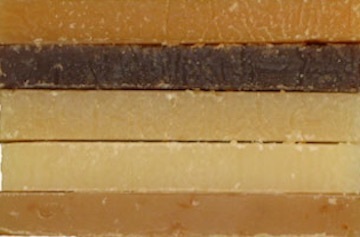 Minimum weight is 7.5 ounces, or two and a half bars of our regular size soap. Goat Milk Soaps in this Sampler will include Olive, Coconut, Palm and Castor Oils, Shea Butter, Cocoa Butter, lard, Sodium Hydroxide (Lye), Goat Milk, Mountain Spring Water, fragrances.